Welcome to Stamford, a coastal community along Connecticut’s shoreline. Stamford is a city of approximately 117,000 citizens, consisting of 37.3 square miles. 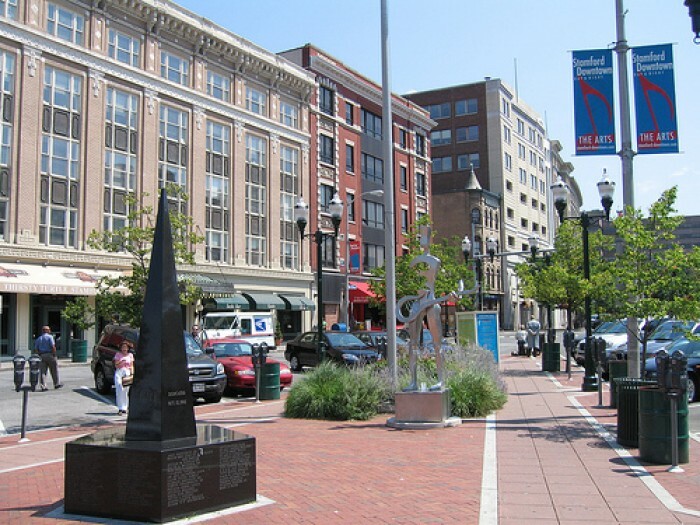 Stamford is 25 miles to the northeast of New York City, and 40 miles southwest of New Haven. Connecticut’s Capitol is Hartford, which is 90 miles to the north. Stamford lies within Fairfield County, and borders Greenwich, New Canaan, Darien, and Pound Ridge, New York. Stamford is a City that works! Our successes have flourished in the last five years, as the City of Stamford has been recognized and awarded in many different categories. Stamford is an economically sound community and continues to pursue appropriate economic development initiatives to both attract and retain companies and corporations. Within the last five years, Stamford has increased its housing units by adding 1000 rental apartments, with over another 1000 units planned for the near future. One of the key measures of the quality of life in Stamford is the crime rate, which has seen double digit decreases during each year of Mayor Malloy’s tenure. The Mayor continually works effectively with various federal agencies to redevelop areas within the City of Stamford. The United States Department of Housing and Urban Development awarded the City a $26 million HOPE VI Grant to address the site of a blighted housing complex. In addition, the City was designated one of sixteen communities nationwide as a Brownfields Showcase Community. Subsequently, the City was the first in the nation to provide a Brownfields Revolving Loan to address the clean up of a contaminated ship yard to provide for 325 units of housing.. In the early part of the 20th Century, Stamford progressed from a factory hub to a research center, and in the last quarter of the century, to the country’s third largest corporate headquarters community. Today, we are the 4th largest city in Connecticut and our economic growth has soared as we have become known as a financial center. We have also been ranked as the eighth largest business center in the United States. In the past six years, we have seen incredible growth, and added to our list of prestigious corporate headquarters is the North American Headquarters of UBS. We are a City with many facets- as we offer both urban and suburban elements ranging from the multi-acre homes in wooded North Stamford, to our splendid corporate downtown center, to the beautiful shoreline areas that envelop our parks and beaches. In keeping with revitalization, the Mayor is working on implementing one of the City’s major projects which will vastly improve a waterfront area along our Mill River- a body of water that traverses the downtown. The central core of our City- Stamford Downtown- offers a wide assortment of places of entertainment, fine restaurants, magnificent retail stores, a shopping mall, and a variety of interesting attractions and places that create an atmosphere of fun and excitement for people of all ages and preferences. Our downtown is also home to the University of Connecticut’s Stamford Campus which is bustling with students coming and going at all times of the day and evening. Stamford’s proximity to New York allows those who live and work here ample opportunity to avail themselves of its cultural, retail, employment and other resources. Metro North Railroad provides express train service to New York’s Grand Central Station in approximately 40 minutes. The Stamford Transportation Center (our rail road station) is located in Stamford’s downtown business district, near I-95, which is Connecticut’s interstate highway. Another major highway is Route 15, the Merritt Parkway, which crosses Stamford and merges into New York’s Hutchinson River Parkway. Mayor Malloy continues to be a strong supporter of the public school system, as Stamford is proud of its public schools and the multicultural diversity which remains our greatest strength. He initiated a School Resource Officer Program in our community and assigned police officers to all of our high schools and middle schools to further assist with education and instruction of our students and to facilitate communications between our young people and the police. We have been recognized as being one of ten school districts across the country to be named a model of exemplary education reform by the National Commission on Teaching and America’s Future, and 79% of all high school graduates pursue higher education. Stamford is one of the first cities in the country, and the first in the State of Connecticut, to implement a School Readiness Program, which offers all four-year olds in our community the opportunity to receive a pre-kindergarten education. Our program was cited as a model for the rest of the nation by former U.S. Secretary of Education, Richard Riley. In addition, this initiative received an outstanding achievement award from the US Conference of Mayors and a designation of Stamford as one of the most livable Cities in America. Stamford’s coastal locations and vast amount of open park space are integral parts of our community and creates beautiful atmosphere which distinguishes us from a “big” city ambiance. To further preserve this unique characteristic, the Mayor has established a Parks Master Plan which will continue to maintain our recreational areas and provide the citizens of Stamford an exquisite place in which to live and work. Through Mayor Malloy’s hard working efforts, Stamford continues to significantly outperform others, all due in part to our growing economy, our highly educated workforce and overall pro-business climate.